I laid in bed that night and struggled to find sleep. The conversation with my teenage son playing over and over in my head. Oh, how I wish he knew how much I loved him and how amazing he is! And yet, I was disappointed that all of my words had been critical. My heart ached. I had been so busy with the demands on my time, that recently I had felt like a failure in the positive parenting department with all of my children, not just this particular teen. I knew that I had to find a way to compliment, encourage, and show my children my love and affection, even when they were prickly, difficult teenagers or toddlers. I was already struggling with trying to juggle all of the things I was responsible for, but I knew I needed to find a way to uplift instead of tear down. The quote, “The way we talk to our children becomes their inner voices”, made me sad. Had I done everything I needed to that day to build a strong, positive inner voice? As I prayed for help and pondered the problem over the next few days, the idea for a LOVE wall was born. 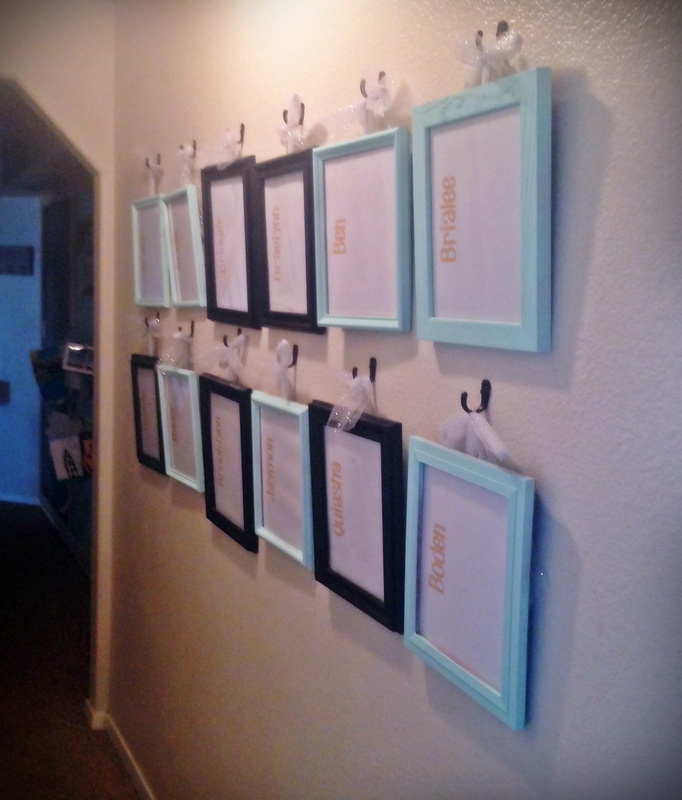 Using dollar and thrift store frames, a can of spray paint, and some coat hooks, I hung a frame for each child on the wall. (Here is our most recent version). Throughout the day and week, I take time to write down little notes using a dry erase marker. Sometimes a scripture or words of encouragement. And even, requests for help. Recently, our teenage daughter was going through some difficult challenges. I prayed that I would know what to say to help her get through it. A certain scripture came to mind and so that is the note I left her that day — just the scripture. Later that week, she came to me and hugged me, thanking me for the scripture. “It was exactly what I needed to hear and an answer to my prayers”. I am so grateful for the inspiration I received and for the opportunity to be an answer to her prayers. While I’m still critical at times and certainly far from perfect in helping my kiddos develop that positive inner voice, I know that this simple and inexpensive tool has helped make a dramatic difference for my kiddos’ confidence and our relationship.